What’s the story with natural bug sprays? Especially, essential oils? In fact, what are essential oils? Essential oils are the distillation of the ingredients from plants that give them their smell, such as citrus or rose. 2. 40 – 75 drops essential oil. This recipe is essentially calling for 1.6% – 3.0% essential oils. Keep that in mind. Stay with me here. My questions after reading so many recipes, and listening to what my patients were already doing were these: Do these oils work? Are the proportions correct? I’d love to recommend a repellent made of essential oils, but I want to know first, is the recipe a recipe for success? So, this is how I went about researching the topic. The CDC has a page addressing natural repellents, and explains that natural repellents must be registered with the FDA, but not approved. That means they’ve been evaluated for safety, but not efficacy. They go on to list compounds for which there are studies of effectiveness and which they appear to be encouraging. Unfortunately, the literature the CDC references on the above products does not really address the issue of human use. So much for that. An additional problem is that CDC is in business with tick-repellent companies, and has granted a license for production of a Nootkatone spray. It’s not come to market, perhaps because of expense, but the fact that CDC gave a license to a company to produce the spray brings the issue of conflict of interests to their assessments. Next, I did a search of the scientific literature on PubMed, the U.S. National Library of Medicine. None of the studies I read address the kinds of strength of the agent that are encouraged in the DIY preparations, which are pretty consistently 40 drops/4 oz., or 1.6%; nor do they address how long the agents work on people, in the kinds of preparations humans use on skin. Lastly, I turned to Consumer Reports which studied several natural bug repellents as well as the chemical repellents. Chemical products containing Picaridin 10-30%, or Deet 30%, were effective against both kinds of mosquitoes tested, as well as ticks and lasted 7 – 8 hours. But these are the commercial, chemical agents many of us want to avoid, as I do, though if you’re on a long hike and can’t reapply, they’re useful. Natural products are effective, also, but for much briefer periods of time. If you are not going to reapply them often, they will be useless. The effective natural products are all stronger, more concentrated, than the DIY recipes. Effectiveness Aedes, and Culex Mosquitoes and Deer ticks: 3 – 3.5 hours. Effectiveness against mosquitoes and ticks: 3 – 3 ½ hours. Effectiveness against mosquitoes: ONLY ½ hour. The 40-drop/4oz DIY preparation is much weaker than the effective commercial essential oil products, and resemble Ecosmart the most. This means they might will probably only last against mosquitoes around ½ hour, and against ticks – only about 1 ½ hours. So, we need something stronger. This requires an entirely separate blogpost. Much is written on essential oil use at various ages. But a strong caveat is to avoid Eucalyptus and Rosemary in children under age 10. It is not advised to use essential oils on babies less than 3 months of age because their skin is not mature yet and therefore more permeable and sensitive to essential oils. Unlike adults, newborns are also not as capable of dealing with adverse reactions to essential oils. For more details, on what to use with children, try reading Essential Oil Safety – By Robert Tisserand and Rodney Young. 1. I can’t recommend the commonly used DIY recipes, when I see that the more effective commercial preparations are much stronger. If you buy a commercial brand, buy one that has a minimum of 3 hours of effectiveness and reapply every 2 hours. Repel lasts as long as the chemical DEET. 2. If you want to avoid DEET, and like the DIY model: Make a more concentrated mix than the more commonly recommended. a. For a 7.5% solution: 180 drops/4oz. b. For a 10% solution: 240 drops in a 4-oz. spray bottle. 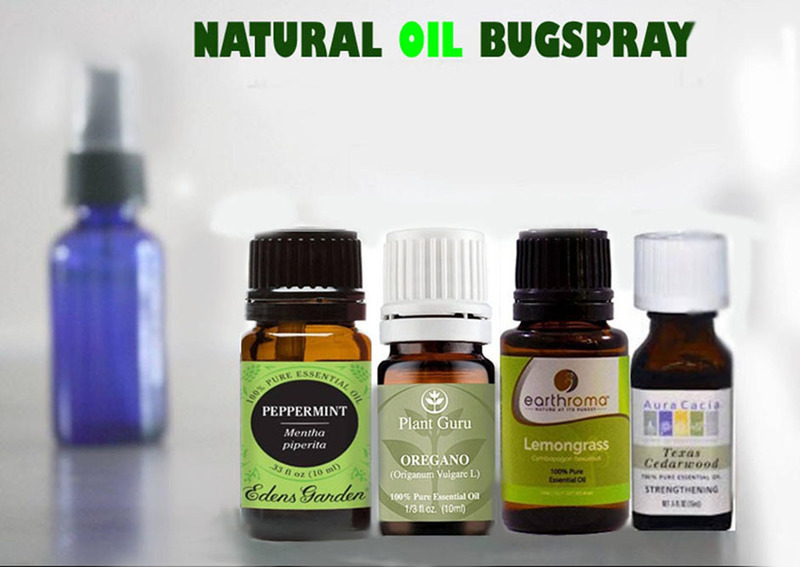 Dr. Mercola makes a spray from citronella, lemongrass, and peppermint, and he has chosen 10% essential oil. I am not recommending the above brands over any others. These are the brands Consumer Reports studied, from which I could get useful human data. If you find brands with comparable strengths, their effectiveness is likely going to be comparable. What did I do? I bought 6 bottles online, made up a concentrated bug-spray, and am giving bottles away as gifts! I keep a smaller spray bottle in my purse or backpack, and spray when I’m about to enter grassy areas. Here’s a supply list for doing that. Ability of two natural products, nootkatone and carvacrol, to suppress Ixodes scapularisand Amblyomma americanum (Acari: Ixodidae) in a Lyme disease endemic area of New Jersey. Suppression of host-seeking Ixodes scapularis and Amblyomma americanum (Acari: Ixodidae) nymphs after dual applications of plant-derived acaricides in New Jersey. Experimental use of two standard tick collection methods to evaluate the relative effectiveness of several plant-derived and synthetic repellents against Ixodes scapularisand Amblyomma americanum (Acari: Ixodidae). Efficacy of plant-derived and synthetic compounds on clothing as repellents against Ixodes scapularisand Amblyomma americanum (Acari: Ixodidae). Novel field assays and the comparative repellency of BioUD, DEET, and permethrin against Amblyomma americanum. Efficacy of the new repellent BioUD against three species of ixodid ticks. Repellent activity of fractioned compounds from Alaska yellow cedar (Chamaecyparis nootkatensis) essential oil against nymphal Ixodes scapularis. Biocidal activity of three essential wood oils against Ixodes scapularis(Acari: Ixodidae),Xenopsylla cheopis (Siphonaptera: Pulicidae), and Aedes, aegypti (Diptera: Culicidae). Effect of a botanical acaricide on Ixodes scapularis(Acari: Ixodidae) and nontarget arthropods.